Spring scenes like this are a few months away at Jade Family Farm. 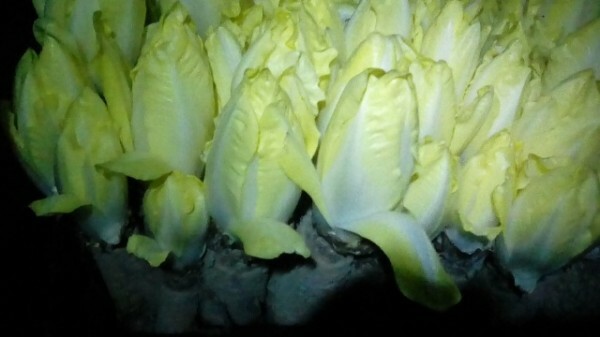 Actually, harvesting is not finished because we are still forcing Belgian endive roots into the pale green chicons prized by chefs and discerning customers at the Tuesday Boalsburg winter indoor market. Roots need to be taken out of the cooler and put into the forcing room, and the chicons carefully harvested and packed for marketing. Lots of crops harvested in the fall keep very well. We had a very fine harvest of carrots, sweet potatoes, daikon and watermelon radishes, onions, beets, parsnips, parsley root, kohlrabi, Napa cabbage, and everybody’s favorite, turnips. Actually, they are really good, and when Ole’ Dad says turnips taste good, you know it is bound to be true. 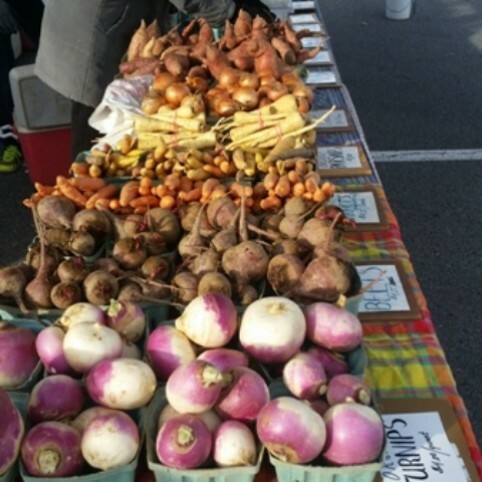 We also sell some of these crops to Tuscarora Organic Growers wholesale cooperative and to a retail outlet at the Broad Street Market in Harrisburg. They don’t just waltz themselves into boxes and the van, and someone has to drive them to outlets and (at Boalsburg) display them and wait on customers. All told, that takes up at least two full days. Onions are a day sensitive crop, which means that they depend on long days to form bulbs. You need to get them in as early as the ground can be worked. In turn, that means that they need to be ready to transplant when that time comes. It turns out that late January and early February is when this needs to be done. My granddaughter Evelyn is our super seed sower and will be starting soon. Another big task is dealing with guilt over not getting far enough down accomplishing tasks on the “to-do” list. The list hasn’t been totally ignored. John and his nephew Jimi built a contraption to hold hay for the goats that keeps it clean and cuts down on waste. Speaking of goats, we are hoping that our does of breeding age are pregnant. When it comes to people, it isn’t so hard to tell that a woman is a couple of weeks away from giving birth. Not so with goats. Trying to figure out if they are pregnant or not is an exercise in imagination mixed with hope.